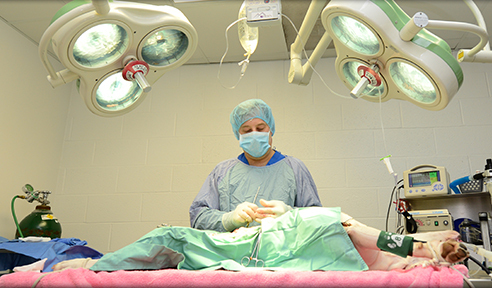 Our hospital provides soft tissue surgical procedures such as: spay/neuter, growth removal, tumor biopsy, laceration repair, urinary bladder surgery and stone removal, abdominal exploratory surgery, oral surgery, Cesarean sections, and emergency surgery. Before surgery, your pet will be screened and anesthetics will be specially selected depending on your pet’s breed, age, and health. Blood tests will also be performed before any anesthesia is given to confirm that your pet is a good candidate for anesthesia, and that your pet’s internal organs are functioning properly. During surgery, your pet’s vital signs will be carefully monitored by a trained technician. Every patient will have their blood pressure, heart rate, rhythm, and blood oxygen levels monitored to keep your pet safe during the entire process. Communication is also an important part of the surgery process, and our staff will keep you fully informed about your pet’s condition. Your pet’s individualized pain management plan may include at-home pain medication to keep them as comfortable as possible during their recovery. Our staff members will walk you through every step and explain everything you need to know for your pet’s post-surgery care at home. If you have any specific questions regarding our surgical procedures, please call us at 615-352-4370.